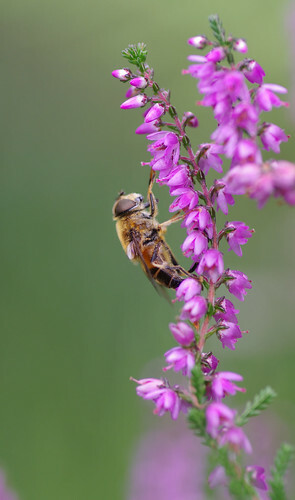 In recent months our attempts to combine walking and wildlife photography has led to a definite emphasis on the latter. Perhaps, after a good deal of practise, we are getting better at spotting species. While I have really enjoyed this, it has sometimes left the walker in me a bit frustrated. One of the principles of walking is the often unconscious thrill of continuous, steady movement. With frequent interruptions to try and identify something, the rhythm is broken and often not easily regained. 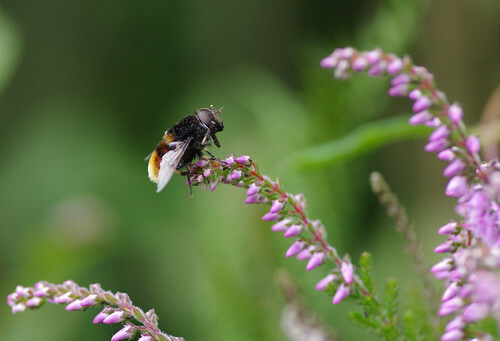 With this in mind we set out with the grand ambition to combine both walking and wildlife once more, by taking in the dizzy spectacle of three different places and an impressive range of habitats - all in one day. A la Ronde, a sixteen-sided National Trust-owned property near Exmouth was our first destination. Since our last visit (when Lady and I spent an unremarkable wait for Sherry on a bench outside) dogs are allowed to be walked on leads around the grounds. Lady welcomed the change in policy and not having had the pleasure last time around, I kept my eyes peeled for new natural phenomena. 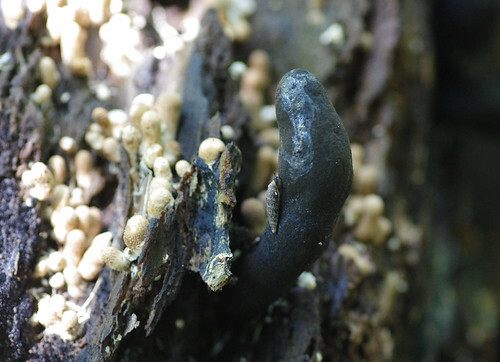 It was not long before I noticed something unusual and interesting growing out of a rotting tree stump. There are a cluster of Common Puffballs to the left but this Dead Man's Finger fungi commanded the centre of attention. Looking at the trail of sticky slime atop it, I suspect the snail had descended. Or had the phallic form a life of its own? Seeing strange spectacles such as this I can only wonder what equally strange superstitions they might have inspired in olden times. 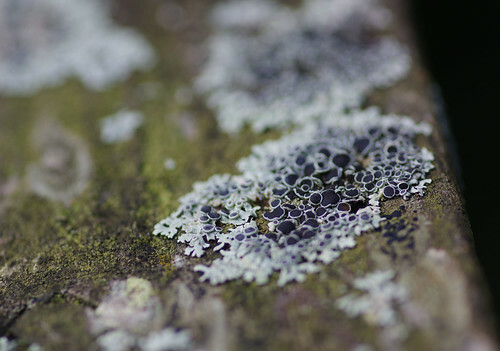 We found this lichen on the top bar of a wooden gate. The green crusty form underneath is a separate species although I have been unable to find exactly which lichen it is. It's the textures of lichens that I find most appealing. The shallow depth of field requires ultra-precise framing. A fraction out either way and the shot is ruined. 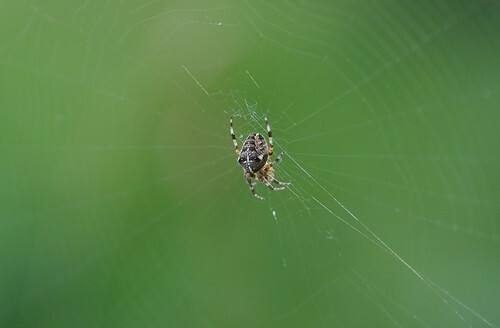 In certain circumstances the 100mm focal length of the macro lens does not get you close enough to the subject. But equally there are other occasions when it is best to back-off. Seeing a creature in its surroundings is often more spectacular than an extreme close-up. You can gain a true sense of perspective, marvelling at how something so small can design something so perfect. And the uniformly green background gives the illusion of immensity behind the web. 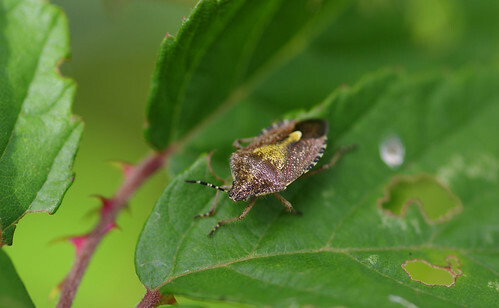 All manner of mini-beasts are drawn to bramble leaves, as landing pads and launch pads, and even the source of their next meal. 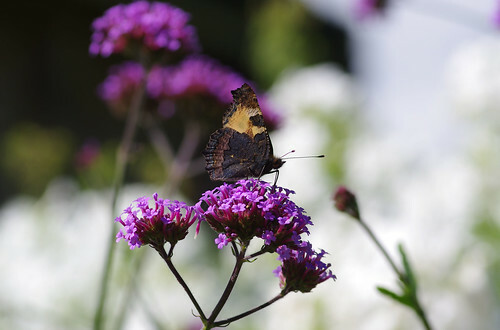 As the day warmed and the light became brighter, butterflies took to the wing. 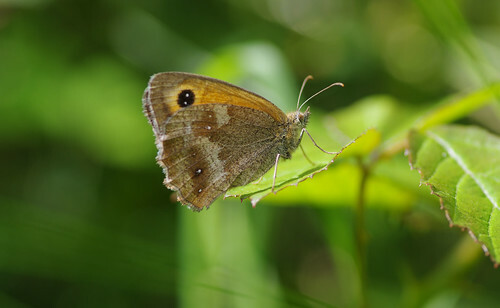 This Gatekeeper paused obligingly for a couple of shots and then was gone. 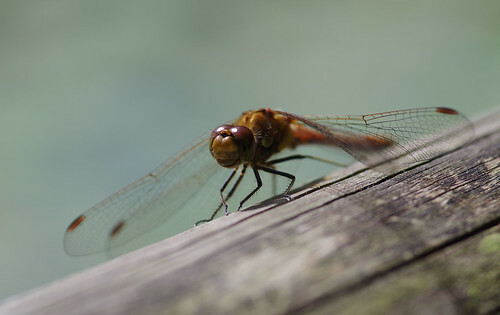 In a certain light, at a specific angle, the Pentax K5 is capable of incredible results. Its quirks and deficiencies are forgotten when it produces shots such as this. And the well-worn truism also applies. It's not just the camera but the photographer behind it. On the three inch LCD screen it's sometimes difficult to judge the best shots. If a shot is completely blurred it is deleted there and then. All the others are kept to be weeded through and shortlisted at home. Sherry spent a couple of minutes trying to catch this butterfly with its wings spread. But it was more inclined to feed than rest. We took the latter option and enjoyed a timely interval for coffee outside the house, before driving on to Bystock Pools. We parked, read the information board at the reserve's entrance and proceeded along the boardwalks. Although there were a few people scattered around the site, exploring its different corners, Bystock possessed a welcome feel of tranquility. 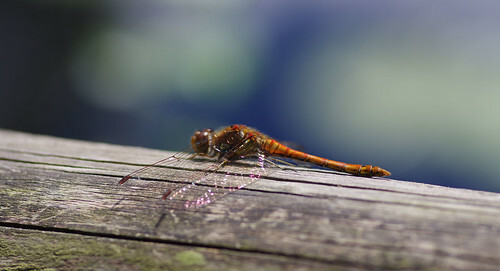 Sherry fired off approximately fifty shots of this one Common Darter specimen from a variety of angles. 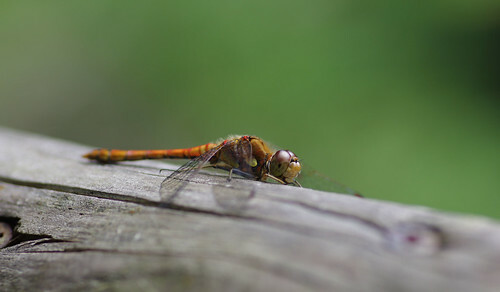 We have seen one before resting on a wooden railing. I could not decide the best one and so have included what I consider to be the top three. 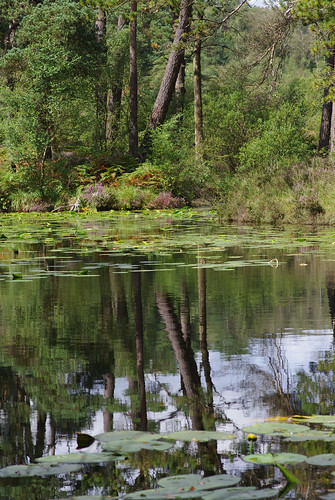 There were tall grasses overhanging towards the lily pads, their emerging pads and the lake's mirrored surface. A close-up of one revealed ensnared animal hairs. These could well have belonged to grazing ponies that we saw on site, roaming happily to find the best grazing pastures. We almost lost our way through the path that did not really look like a path. So we took a different way, going up to the edges of the heath and then down to where these rushes were located, and round to the next pond. 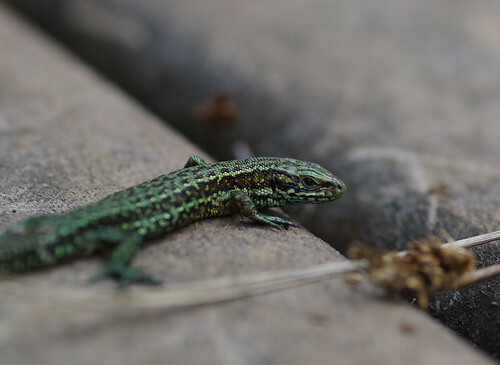 We saw brown Common Lizards wriggling and scurrying their way across the chicken-wire-covered boardwalks and into the cover of rushes by the pond. This green one was more placid. Looking down into the pond, there were one or two sundews where flies had met a sticky end. 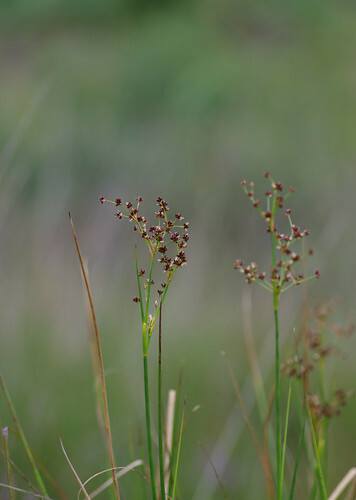 Along peaty paths, maggoty larvae writhed on the burnt flowers of rushes. 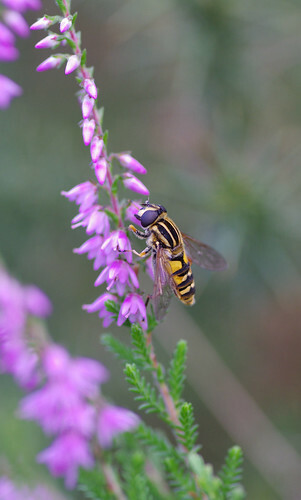 We tiptoed around the browsing, feeding ponies and somehow found a way through the heather, passing more species of hover fly than I had ever seen before in one location. The one above cleaned dusty pollen off its compound eyes and then got its feeding tube out. From this angle the compound eye looks like a button that has been sewn on and is in danger of coming loose. Returning along the main path, I chanced to look over at the margins and saw this organism on the ground. 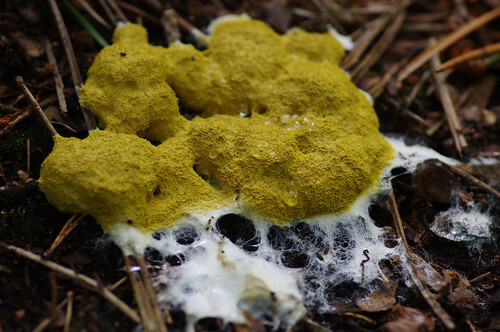 I am pretty sure it is the aptly named slime mould, although other specimens I have seen have been of a much brighter, sickly hue. 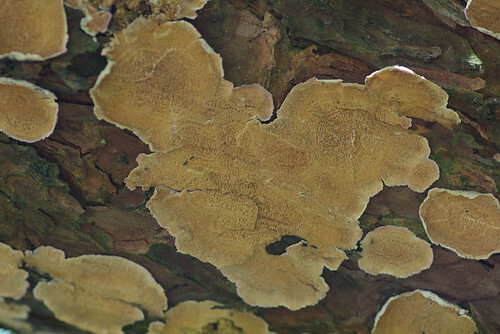 The leaf litter is similar to a bark mulch where this species thrives. 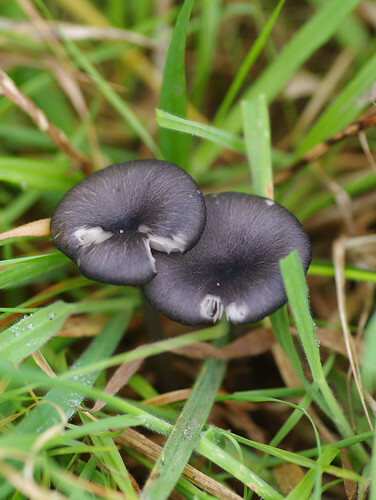 The white stuff around the edges are a sign of the fungi maturing. We continued along the boardwalk, ready to move on to the third and final part of our journey. We drove on to another car park about a mile up the road, disembarked and headed straight along a path bordering East Budleigh Common. 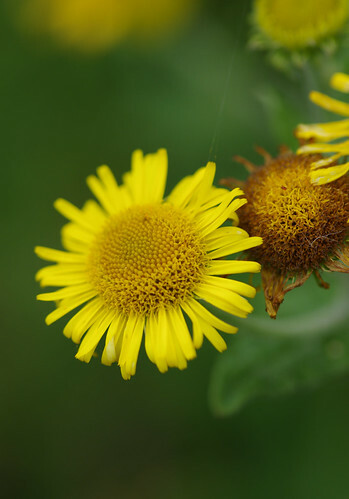 There were at least three different species of thistles by the path but these Carlines were the most impressive. 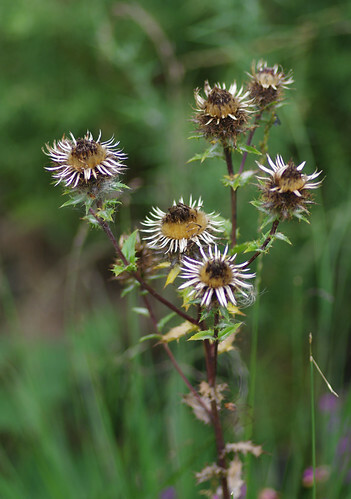 Most thistles wither and look dried-up after flowering. 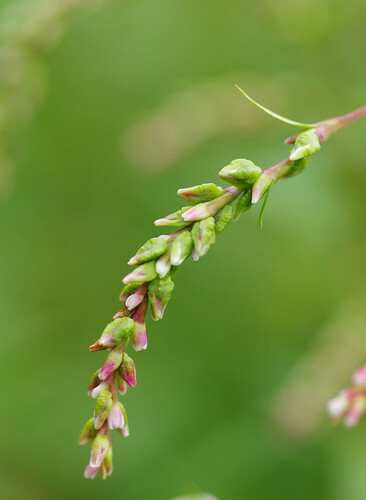 This is the natural flowering state of the Carlines. 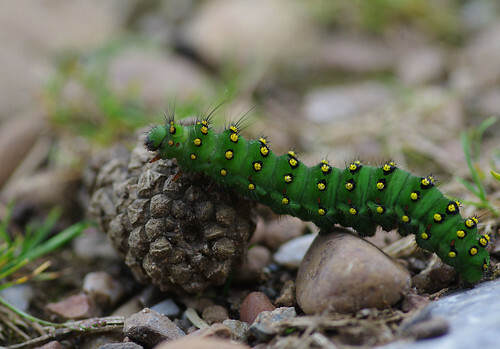 Jane Redman, our companion and wildlife-watching accomplice for the day, spotted this caterpillar while we were looking at thistles. The three of us watched spellbound as it wriggled along the path, climbed over obstacles and coiled its body round a stick and crawled across the path until Sherry lifted it to relative safety. 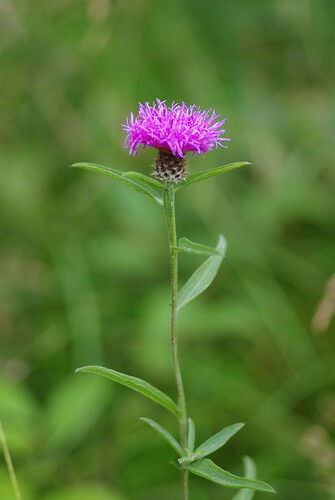 Knapweeds are closely related to thistles. 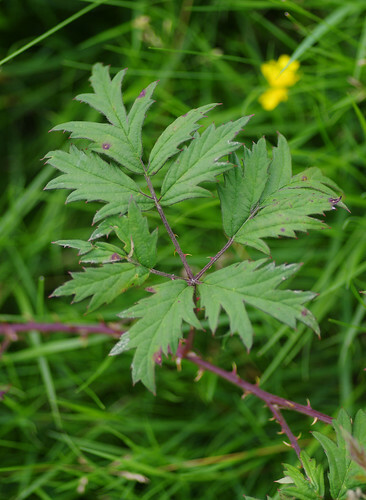 The straight, elliptical shape of the leaves helps identify this particular type. In the end I gave up trying to identify this fungi. In retrospect I should have got down on the ground and examined the gills underneath. But there were too many other things around me to stop and study just one properly. 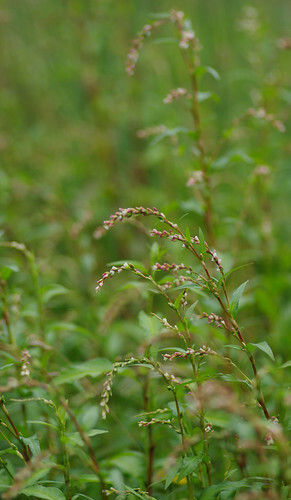 Water-pepper flowers thrive in damp, waterlogged conditions. 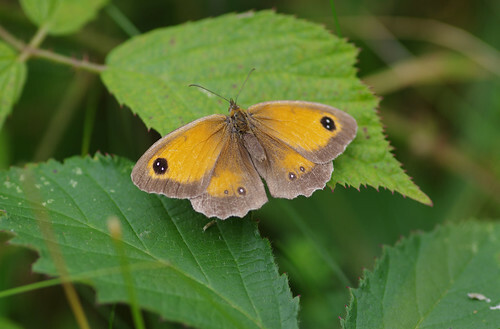 On drier ground, in semi-shade, we found this Gatekeeper with its wings stretched out. Its body was flexed as if it was doing push-ups. I have seen butterflies doing this before but have no idea why they do it. Our path now took us on to the heath. It was a strange sight to look behind us and see Exmouth and the coast, appearing deceptively close. 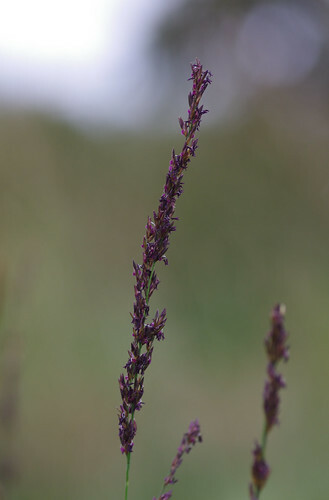 This is a typical moorland grass and one of the most distinctive species when flowering. 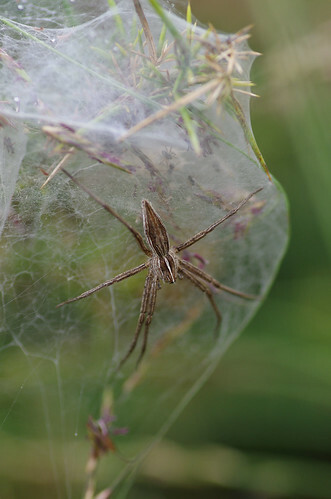 This spider has spun a protective case for its spiderlings. Look closely and you might detect one or two inside it. Some creatures certainly go to extraordinary lengths to protect their offspring and give them the best possible chance of survival. We turned off the heath and turned right along the road. 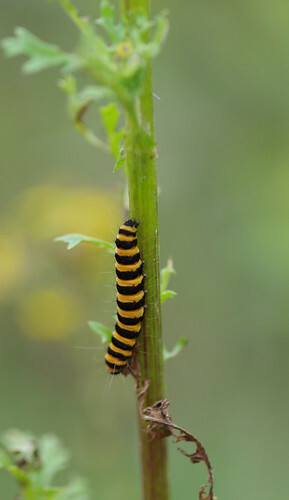 At this time of year ragworts can be covered with these hungry caterpillars and be stripped to the stalks. 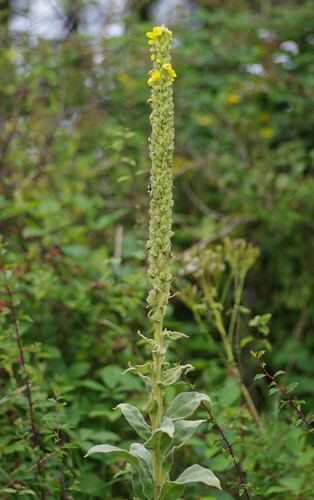 There was a gravelly layby off the road, where this impressive mullein reached for the sky. There were smaller specimens but this one grabbed the limelight. Rather than walk along the road the long way round, we cut across country, heading for the intriguingly entitled 'Fryingpans'. There appeared to be remnants of structures, possibly tracks and trenches. With 'pans' in the title I came up with the theory that some sort of sifting of mineral deposits was done historically. A funny thing happened on the way back. Admittedly we had gone further out than we had intended on East Budleigh Common. But we had literally traversed a mile or more on the map in the blink of an eye. I started imagining wartime time travel experiments and wormholes like invisible membranes that you would not notice passing through. We have seen and recorded countless fleabanes this year but this one proved too compelling to delete. And finally! 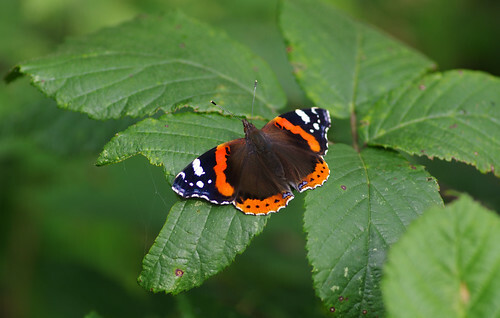 The Red Admiral is perhaps the commonest butterfly species in Britain. 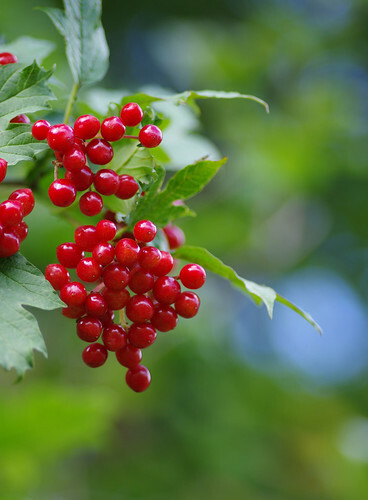 But its colourful display and longevity (it has been known to hibernate during the winter season in garden sheds) earns it a special place in our hearts. This one greeted us in the car park and prolonged our stay. We read the information board, learning how geological history and the wartime importance has made the Pebblebed Heaths such an important specialist habitat. I would love to return here soon and explore the area in greater depth. To explore these areas fully I would advise you take an up to date OS map. Explorer Map 115: Exmouth and Sidmouth.